Is progressive free trade a pipe dream? Can the North American Free Trade Agreement (NAFTA) be redesigned as a progressive trade deal? Foreign Affairs Minister Chrystia Freeland seems to think so. Under her guidance, Canada has entered the NAFTA renegotiations with an eye-catching set of objectives. Not only does Minister Freeland promise that Canada’s negotiators will push for stronger labour and environmental provisions, but they will do so in ways that help address climate change and improve relations with Indigenous communities. Canadians, Freeland explains, want “fair trade,” not just free trade. As such, the Minister is promising to renegotiate NAFTA, adding “more progressive” elements to ensure the deal is “win-win” for people, the environment, and the economy. This claim to a progressive, inclusive trade agenda is suspect. Canada’s recent trade agreement with Europe (CETA), which Freeland touts as “the most progressive trade deal in history,” is rife with regressive provisions that promote the economic rights of multinational corporations over the wellbeing of workers and the democratic rights of citizens. Clearly, the government’s definition of “progressive” needs some work. When it comes to NAFTA and these new promises, there are two areas in particular where the way forward for a progressive agenda becomes very hard to see. Can international trade be compatible with Indigenous reconciliation? The original NAFTA exacerbated an already unproductive and oppressive relationship between governments and Indigenous peoples across North America. In Mexico, for example, NAFTA eliminated collective land rights and facilitated wide-scale expropriation of traditional Indigenous lands. In Canada, the agreement provided enhanced legal protections to multinational resource companies, which fueled new land conflicts with Indigenous communities. Ultimately, NAFTA ignores the fundamental rights to self-government and self-determination of North America’s Indigenous peoples. The trade agreement was negotiated without their involvement, yet its provisions supercede Indigenous (and Canadian) law in the interest of promoting cross-border commerce and investment. The NAFTA renegotiation is a clear test of the Liberals’ commitment to reconciliation. Inviting Assembly of First Nations (AFN) National Chief Perry Bellegarde to Canada’s NAFTA advisory council is a step in the right direction, but it’s a far cry from meaningful Indigenous participation in the NAFTA negotiations. Similarly, an Indigenous chapter, though promising, will mean little if its provisions are weak or unenforceable. The AFN advocates for “First Nations participation in trade initiatives… on the basis of the recognition of First Nations inherent and Treaty rights” and “First Nations inherent right to trade with and between nations in North America and globally.” The Canadian government has yet to show us what a trade negotiation grounded in Indigenous participation and rights really looks like. Can free trade be compatible with climate action? At the forefront of Canadian climate efforts are a series of high-profile greenhouse gas emission reduction targets. Unfortunately, progress toward even the more modest of these goals has been mixed. Canada’s federal and provincial emission targets do not go far enough to contributing our fair share to global climate efforts. Moreover, the Trudeau government has undermined its own successes with an “all of the above” climate policy that sees new fossil fuel infrastructure as compatible with new environmental protections. The NAFTA renegotiation may push Canada’s environmental doublespeak to its breaking point, as many of the ambitious policies Canada needs to rapidly reduce greenhouse gas emissions run afoul of NAFTA and other international trade treaty obligations. As it stands, NAFTA guarantees Canada will export a set proportion of fossil fuel energy to the U.S. every year. NAFTA also includes extraordinary rights for multinational fossil fuel companies to challenge any new environmental regulations. Not to mention that, at its core, free trade is designed to increase the production and transportation of cheap goods around the world regardless of the associated environmental impacts. Canada has created a NAFTA environmental advisory council that will supposedly push for stronger environmental protections to be included in the deal. It remains to be seen if the council, which includes a former Shell executive, will advocate for policies that move North America toward deep decarbonization or whether it will be satisfied with a surface acknowledgement of climate change within the new deal. A truly progressive NAFTA must explicitly make space for government measures to seriously tackle climate change, such as a moratorium on new fossil fuel development. It must also raise environmental standards to the highest common denominator in all three NAFTA countries. For example, a progressive NAFTA would introduce a continental carbon price that keeps pace with the most ambitious jurisdiction in any of the three countries. The Trudeau government likes to call itself progressive, but for NAFTA to meet that standard it first needs to grapple with these fundamental principles of progressive policy. If the answer to the above questions is “yes,” then governments involved need to show us how. Chapters on the environment or Indigenous peoples mean nothing if they aren’t strong and enforceable. Canada has established no precedent for a truly progressive trade agreement, so the onus is on our government to make that case before it cashes in on the “progressive” label. If the answer to either question is “no,” then something has to give. Either the “progressive” label needs to be firmly abandoned—forcing the government to own up to its classically pro-corporate free trade agenda—or we need to step away from NAFTA entirely. That outcome wouldn’t be as costly as it sounds. 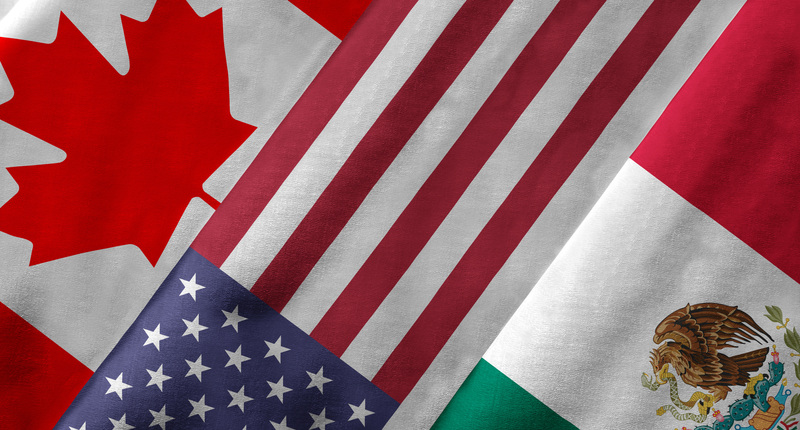 As studies have shown, the economic impacts of withdrawing from NAFTA would be modest and the benefits, in terms of sovereignty, individual rights, and environmental protection, could be significant. So what’s a progressive government to do? Hadrian Mertins-Kirkwood is an international trade and climate policy researcher at the CCPA. Follow Hadrian on Twitter @hadrianmk.